Mandarina Duck has launched So Bella! 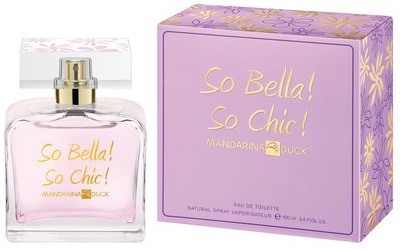 So Chic!, a new fruity floral fragrance for women. So Bella! So Chic! is possibly a flanker to 2014's Oh Bella. A new and passionate Mandarina Duck woman is here. So beautiful, so elegant, so chic that she never goes unnoticed. This is an active and urban woman, full of life. An aura of sparkling beauty surrounds her as she walks down the street. Her charisma, energy and vitality can be felt in her swift and graceful movements. She adores hats. You pass her by without catching a glimpse of her face, but you can’t help noting the spark of her fragrance. She attracts attention. She doesn’t go unnoticed. Oh Bella was developed by perfumer Daphné Bugey. The notes include bergamot, apple, violet leaves, freesia, rose, magnolia, raspberry sorbet, cashmere wood and white musk. Mandarina Duck So Bella! So Chic! is available in 50 and 100 ml Eau de Toilette.